Thursday, April 18 | 6pm – 8pm | CRC, 40 Oak St. The Ford government’s first budget came out on Thursday, April 11. It is bad news for the people. But the populist Premiere knows that bad news must be delivered with a smile, and confusing rhetoric. So join us to make sense of how the budget will impact our lives, from education to healthcare to legal representation, to social assistance, and more. Then let’s figure out how to build a resistance movement that can become Dougie’s worst nightmare. Amina Vance is a high school student and one of the lead organizers of the Ontario-wide student walkouts. Jackie Esmonde is a staff lawyer with a legal aid clinic, the Income Security Advocacy Centre and a member of Migrant Workers Alliance for Change. Shelagh Pizey-Allen is the executive direction of TTC Riders. Kelly White volunteered with the Toronto Overdose Prevention Society and now serves as Coordinator of the Overdose Prevention Site at Street Health. John Clarke has been active in anti-poverty struggles for over 40 years, and is a member of the Ontario Coalition Against Poverty. What sort of view you ask? Well, not of the homeless camp, obviously. The City demolished that and evicted the people living there two weeks ago, remember? What are we going to do it about you ask? You ask a lot of questions, but we’ll tell you. We’re inviting you to join us for a free 3-course dinner under the Gardiner. Our chefs aren’t Top Chef Canada winners, but they do win at human decency. Together we’ll eat, be lively, and take in the view of the brazenness of the wealthy and the brutality of the city. Bring your noisemakers and email us your music requests. While you’re at it, email Mayor Tory (mayor_tory@toronto.ca) and tell him we need adequate shelters and rent-geared-to-income housing. Homelessness demands action, yet the City refuses to take any. In the midst of a deadly housing crisis, they’re shutting down respite sites without opening sufficient replacements. By late spring, over 400 emergency shelter spaces will be lost. The City is banking on homeless people going back to sleeping in ravines, parks, and on the streets as the weather warms. 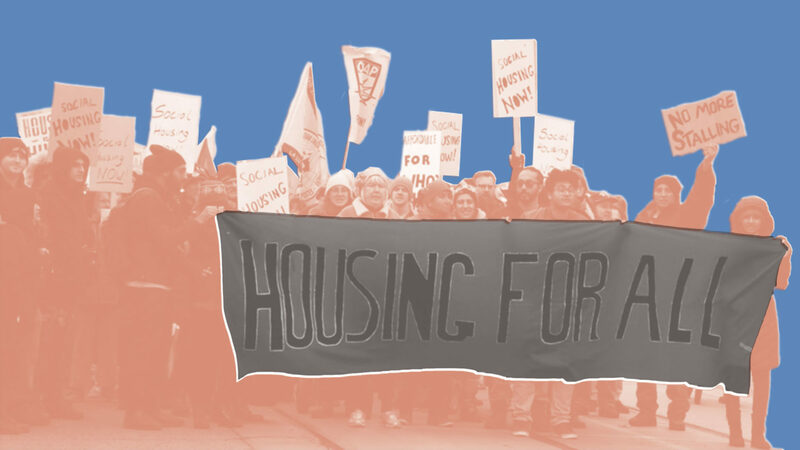 Toronto needs adequate shelters and rent-geared-to-income housing. Mayor Tory’s plans build neither. Stop the ongoing evictions of homeless people through service reductions. Add 2000 new shelter beds in 2019. Expropriate 214-230 Sherbourne, a series of 7 properties vacant for 10 years. 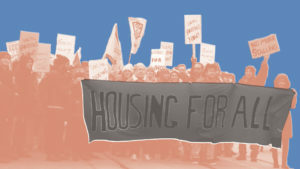 Build rent-geared-to-income housing on City owned properties. Wednesday, December 5 | 6pm-8pm | St.Luke’s Church, 353 Sherbourne St. 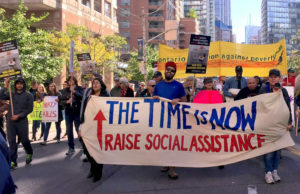 The Ford government has announced its planned changes to social assistance. It is clear they intend to use social assistance as a weapon in their war on the poor. 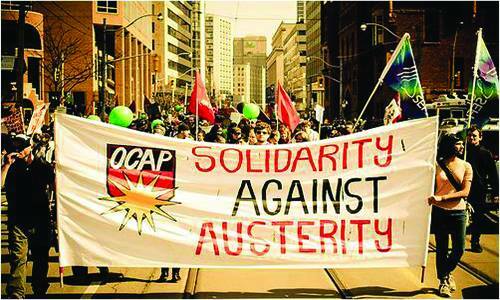 OCAP’s analysis of the announcement can be read here. Join us to help make sense of the cuts being proposed, and to talk about how we’re going to fight back. The Ford government is getting ready to announce a series of changes to social assistance. The announcement was originally due by November 8 but has been delayed to November 22. It is widely expected to introduce sweeping cuts to OW and ODSP. 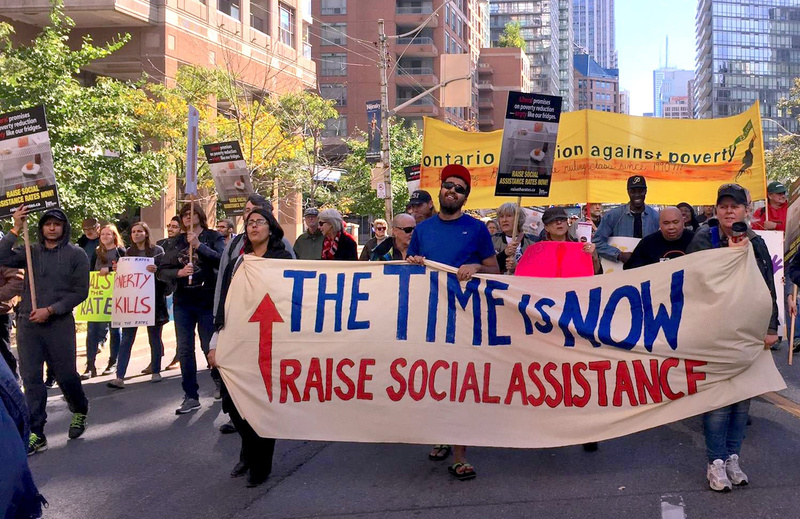 Since coming to power, Doug Ford has already cut the rate increase to OW and ODSP in half and suspended a series of positive changes that were scheduled to come in this fall. Join us to break the isolation and talk about how we’re going to fight back. Lunch Provided. Register for Buses Here. 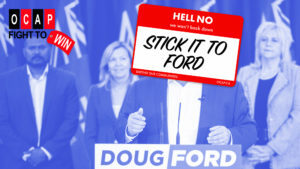 On November 17, the Ford Conservatives will further their gruesome vision for Ontario at their party convention. Their government “for the (rich) people” has already attacked social assistance, job protections, minimum wage, healthcare, education, and environmental safeguards. They’re not finished. In two weeks, they’ll announce a series of sweeping cuts to Ontario Works and Ontario Disability Support Program. 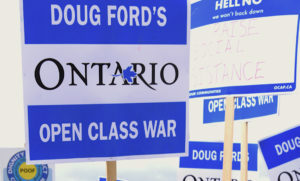 Ford’s vision for Ontario is a grim one for ordinary people: where we are paid less but must pay more for services; where business executives and owners get richer by forcing the rest of us to work with fewer job and unemployment protections; where the rich unite in their quest to exploit and pit the rest of us against each other in a struggle to survive. 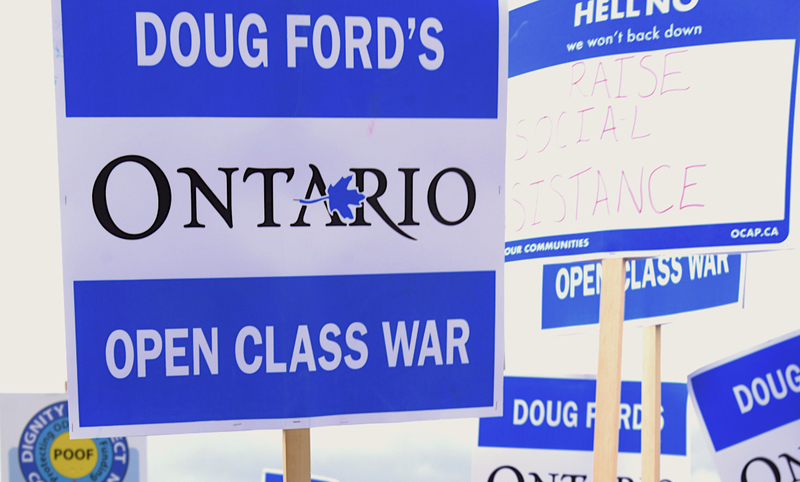 On November 17, we will demonstrate that attempts to “open Ontario for business” on this basis will be blocked. 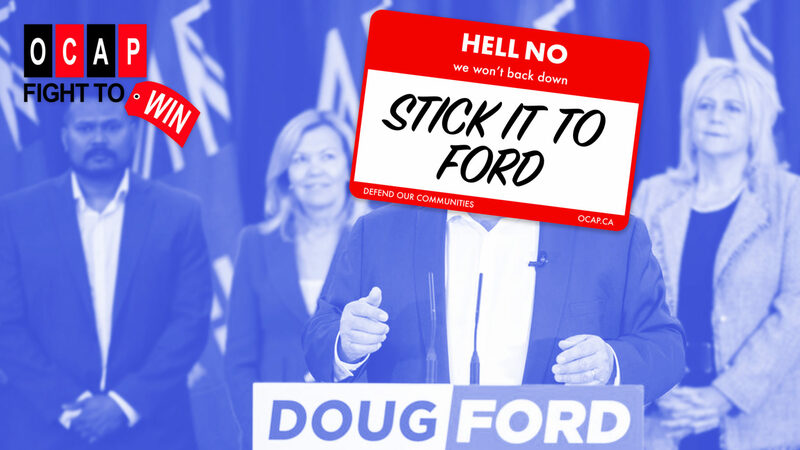 To make sure Ford gets the message, we’ll start with an action at Ford’s own business: Deco Labels and Tags. It’s time to defend our communities. Join us. Thursday, October 18 | 6pm – 8pm | CRC, 40 Oak St.
cut backs rests with social movements. With dramatic cuts to social assistance, min wage, healthcare, transit, and more expected, it’s time to gather our forces. So come hear from movements that are fighting to defend our people. Speakers: John Clarke (OCAP), Anna Willats (RadTO & thecitywefightfor initiative), Em Carl (Toronto Overdose Prevention Society), Andrew Peters (No One Is Illegal-Toronto), Edgar Godoy (Ontario Health Coalition), and Anna Lermer (TTCRiders). John Clarke is an organizer with the Ontario Coalition Against Poverty, a poor people’s direct-action organization fighting to win since 1990. Anna Willats is member of RadTO, which just launched the visionary thecitywefightfor platform for the kind of city we must fight to build, regardless of who wins the municipal elections. Em Carl is a member of the Toronto Overdose Prevention Society, which has been engaged in a gutsy and lifesaving fight to address the overdose crisis. Andrew Peters is a member of No One Is Illegal-Toronto – an immigrant justice organization that is mobilizing to block attempts by white supremacists Steve Bannon and David Frum to speak in Toronto. Egdar Godoy is the campaigns manager at the Ontario Health Coalition, which is organizing a province-wide mobilization at Queens Park next week. Anna Lermer is with the TTCRiders – an organization fighting to expand access to transit and stop its privatization. The monthly Speakers Series is where we gather to discuss issues that are critical to the success of poor people’s movements. It’s where we build our capacity to fight to win. 214 – 230 Sherbourne are 7 adjacent properties located at the southwest corner of Dundas and Sherbourne. For at least 50 years, three big houses on this lot provided housing for poor people. About 10 years ago, two of the houses were demolished, leaving just one 30-room house whose residents were then pushed out. A decade later the lot remains empty and the house vacant. Meanwhile, the church across from it struggles to shelter the escalating numbers of people dumped on the streets by Toronto’s deadly housing crisis. The neighbourhood desperately needs housing that poor people can afford. So when the properties were listed for sale earlier this year, OCAP mobilized to get the City to purchase them. 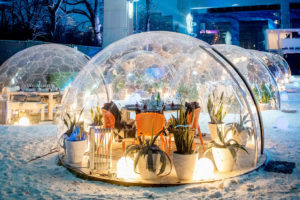 But the owners took the properties off the market, preferring to sell to condo developers willing to pay more than the already inflated market price. If the owners won’t sell to the City, the City must take the properties over – expropriate them – and build social housing. The owners still get paid but the end result is housing for poor people, and not another gentrifying condo. 27 organizations have signed an open letter calling on the City to expropriate. It’s time. Join us on October 11, and let’s fight to win!